My dog, Henry, has a biological clock and it’s ticking like crazy. Lately it’s been telling him 5 a.m. If there’s anything you should know about 5 a.m., it’s that it’s very early. 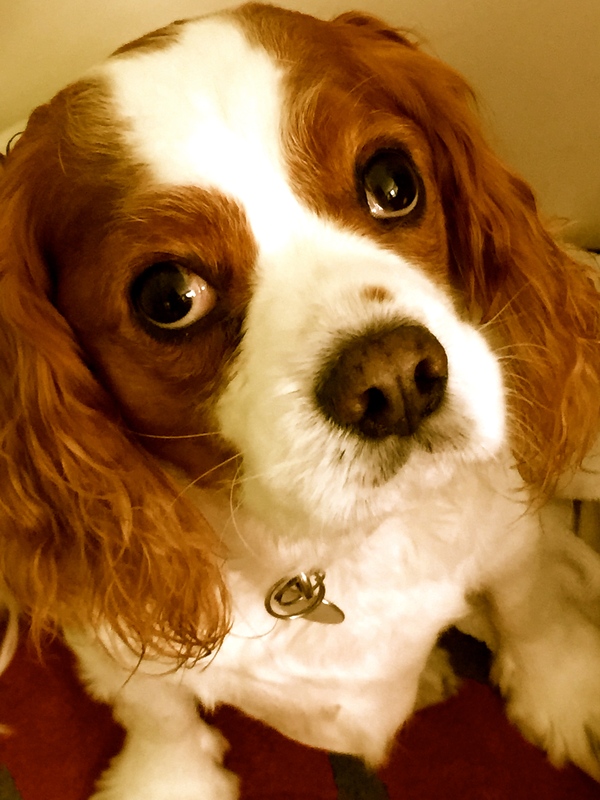 For the last five days, that’s the hour that Henry, my Cavalier King Charles Spaniel has been waking me up. In other words, on Sunday, Monday, Tuesday, Wednesday and today, Thursday. It’s pitch-black dark at 5 a.m. I don’t want to get up at 5 a.m. So I cover my face with my pillow, and in the process knock young Oliver off his perch around my head. “Yowza,” he cries as he falls off the bed, scrambling back on a second later. Ugh, it’s amazing how early it is at 5 am. It might as well be the middle of the night, if you ask me. At 5 a.m., all I want is one more hour of sleep. But then I hear that little high pitched bark of his. It’s just a staccato bark, but its high-pitch falsetto can break sound barriers. It’s piercing and unnerving. I peek out from under my covers, to see what the fuss is about, and discover Henry’s larger-than-life face peering down at me as if I’m some odd specimen he dragged in from outside. Which is exactly how I feel at 5 a.m.
“Go back to sleep,” Henry, I mutter from under the pillow. So, exactly how many more days before we switch the clocks back or spring forward? (Note: I’m taking part in NaBloPoMo. The more civilized name is National Blog Posting Month. Thirty days, 30 posts. This is #6. If you have suggestions for a post, please let me know. Seriously. I’m running out of ideas, and I don’t think you want me to post my to-do list. grrrrrrrrrrrrrrrrrrrrrrrrrrrrrrrrrrrrrrrrrrrr. it’s dark at 4:30 here in MN. I HATE it! Thankfully, Henry’s clock is readjusting itself. Today he woke up at 7! I was beside myself with joy! Not being a pet owner and all, I hadn’t reckoned little critters would be upset by the time change. Maybe he needs a soft bone to gnaw on. Heck, try anything to keep those late weekend sleep-ins. I am up at 5.30 every morning except on weekends Monica. If I am awakened any earlier, I am grumpy pants. I somehow think I have it planned just right in my head – falling back is best for me because 5 am is really 6 am and I can feel better about waking up when it is still ridiculously dark. Spring forward and I am extremely annoyed. Not only is it 4 am when I wake up but I have lost an hour too. Oh and somewhere in my head or my inner clock, I want to beat my alarm or silent alarm. So I end up waking up too early.. Rather annoying. Go figure. Poor Henry, adjusting to time can’t be easy. I hope his clock settles soon. MM, I know exactly what you mean about springing forward. Totally annoying. Poor Henry? Poor me is more like it. And poor Oliver. We’re the ones that have to put up with his squeaky bark. Sheesh. Don’t get me started! I think any civilized country should be able to pick a time and stick to it. I hate the back and forth. WTF? And I rarely curse. I don’t mind the “fall back” because we gain an extra hour, of sorts. But why must we also spring forward? I’d rather fall back twice a year and leave it at that! Ha! Grrr, I know just what you mean — Dallas is doing the same thing! I refuse to arise at that beastly hour. I merely flip over and snuggle deeper into my covers, letting the fur-kid work it out for himself. He’s also taken to “dozing” earlier in the evenings, and I have to work to keep him up and re-set his clock! Debbie, Let’s put Dallas and Henry in the same room together so they can sleep and wake each other up instead of waking us up. Let them sort it out while we get some extra zzz’s, don’t you think? We changed back to GMT the last full weekend in October, so it now gets later earlier. We get up at 5.30am most days so the wife can get sorted and off to work. Small dogs do have a penetrating bark, one that can shift plaque off teeth at 10 paces. Tell Henry that true royalty are not morning people and always rise late, I mean you can’t imaging the Queen over here awake at 5am and doing bacon for her husband. I mean how common!!!! I’ll try, Robert, but if there’s anything you should know about Henry is that he’s high maintenance and stubborn. He’ll do what he wants and no one can tell him otherwise! Poor you and poor Henry. I’m still stuck in Daylight Savings Time, too. I struggle to stay awake in the evening and then I wake up around 4am and this is making me very cranky. I can’t wait until my sleep clock straightens itself out!